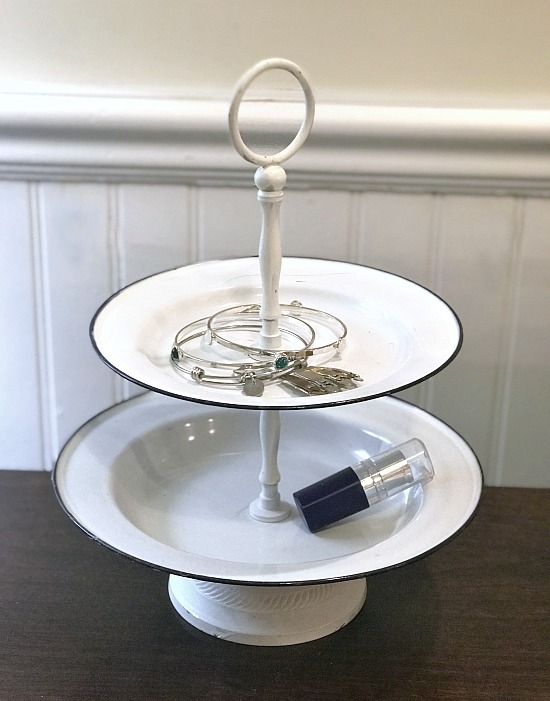 I made this tiered tray with my favorite dishes and it could not have been easier to make! I found the brass metal base and column part at the thrift store. The original dishes had broken so they were selling the center piece with no dishes. I brought it home, took it apart, and painted the brass with chalky paint. I drilled holes in the center of 2 enamelware dishes I was hanging on to. One enamelware dish was a small plate and one a bowl. When you drill holes in enamelware, do it carefully. Put a piece of painters tape on the center mark then drill through the painter's tape. The tape keeps the enamelware from chipping. All that was left to do now was to screw the dishes between the columns. 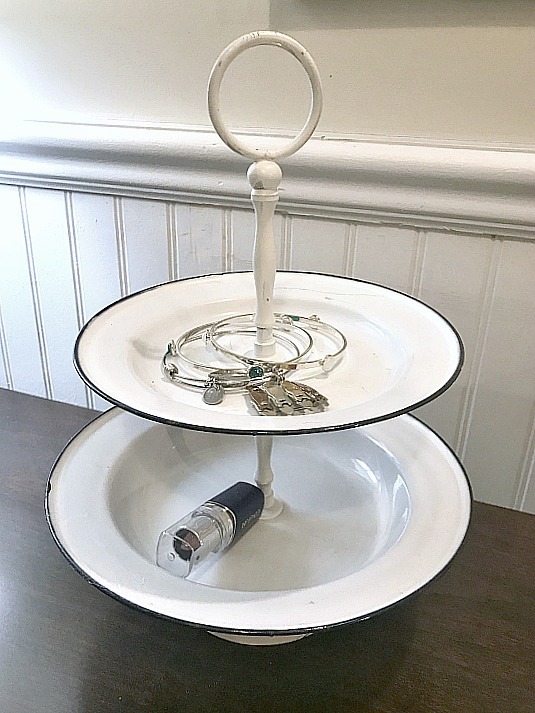 Check garage sales and thrift stores for broken or ugly tiered trays you can take apart and make new with your favorite dishes. my dresser in farmhouse style! Interested in more enamelware ideas? 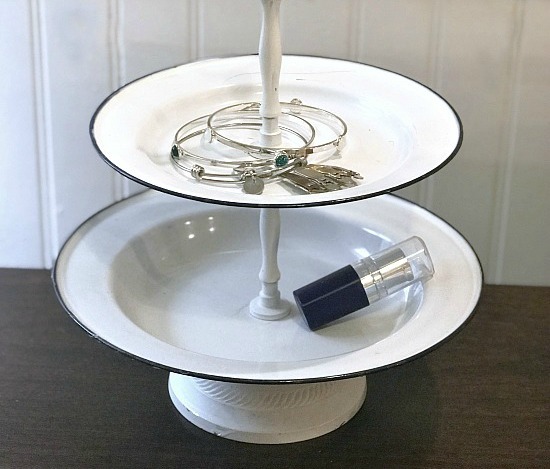 Love this enamel tiered tray. 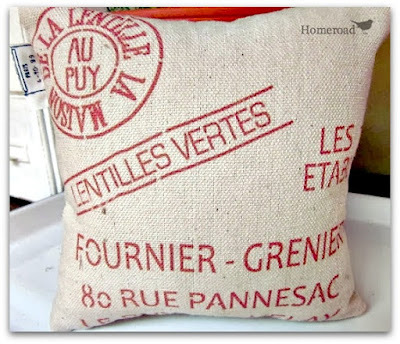 I'll be on the lookout for items to make one myself. Thanks for sharing. Thanks Debra I love the way it came out too. It was easy too! Wow, love this idea. Did you put tape where you drill first. 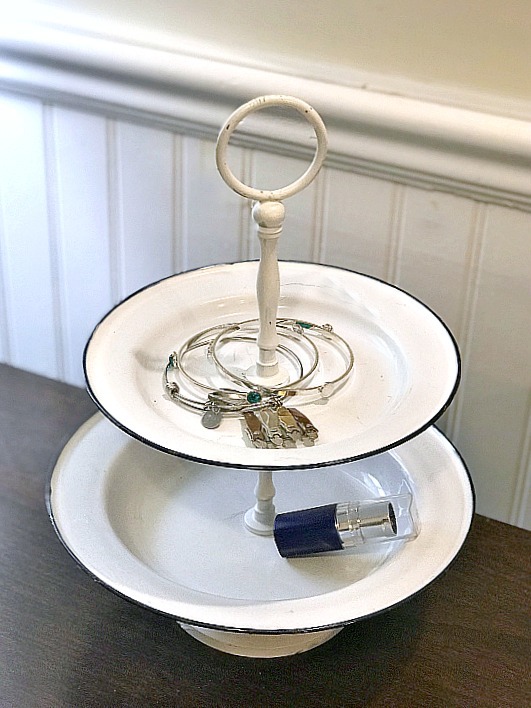 I love enamelware and this enamel tier tray is so pretty! I will have to keep my eyes open for some enamelware! Thanks for the tip of using painters tape, I wouldn't of thought of that. Sure! I love enamelware too and I'm happy with the way this came out! woohoo! 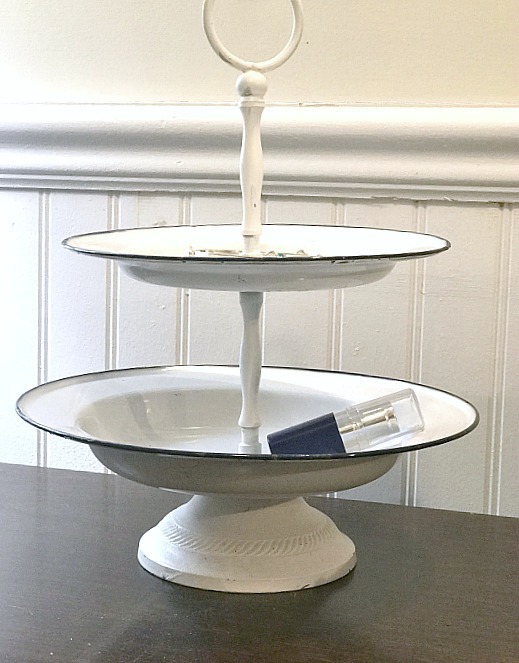 Susan, this tiered tray is fabulous! The enamel pieces I have are pot lids with handles. :( tough to drill. 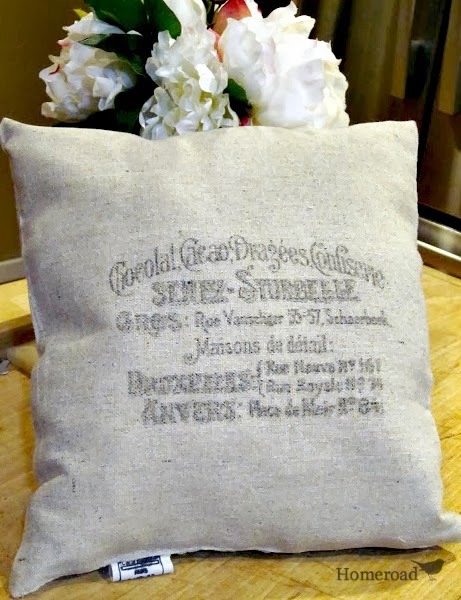 Pinning, and featuring you on Talk of the Town! Thank you so much Gail!!! I'd love to be featured xo!